As part of the Mulkear Life project (www.MulkearLife.com), a ramp pass was installed on a weir at Annacotty on the Lower River Mulkear for the purpose of allowing sea lampreys to pass this obstacle. In numerous media releases it has been claimed that this pass allows lampreys to pass over this weir. But does this really work? and is this a suitable mitigation approach for assisting lampreys pass barriers like this? Is this “good news for lampreys“, or will it result in ineffective passes being installed on other rives? Is this “restoring the Lower Shannon Special Area of Conservation” ? or just hype? Lets look at the evidence. Three species of lamprey occur in the River Mulkear and it is clear that this ‘pass’ is well beyond the swimming and climbing capabilities of river lampreys or brook lampreys. With reference to the current scientific literature this pass is also unlikely to be of any significant use to sea lampreys, and as yet no data is available to show that this pass works. Sea lampreys can to some extent pass through the denil fish pass at the centre of Anacotty weir, and they have been recorded spawning upstream of Annacotty in the past. Results from a 2012 study of ammocete populations in the river by ECOFACT confirmed that some sea lampreys do get past the three obstacles in the lower reaches of the river, and that this has been happening prior to the installation of the experimental pass based on the age of the ammocoetes encountered (Ecofact, unpublished 2012 commercial report). During radio tagging work on sea lampreys undertaken by Mulkear Life during 2011, sea lampreys were not recorded passing through the weir at Annacotty. However, some of these lampreys were released above the weir and managed to make their way upstream according to Mulkear Life. Radio tagging work did not show any lampreys using the pass. Based on current understanding of sea lamprey climbing ability it is unlikely to prove to be of any significant value to sea lampreys as they are incapable of the “attach-twitch-attach” climbing ability that other lampreys species have (i.e. Entosphenus tridentatus). Reinhardt, U.G., Binder, T., and Gordon McDonald, D. (2009) Ability of adult sea lampreys to climb inclined surfaces. Pages 125-138 in Brown, L.R., Chase, S.D., Mesa, M.G., Beamish, R.J. In: Moyle, P.B, editors. Biology, management and conservation of lampreys in North America. American Fisheries Society, Symposium 72, Bethesda, Maryland. Reinhardt et al (2009) state “we found no evidence, in either a laboratory or field setting that sea lampreys can climb up wetted surfaces using an attach-twitch-attach strategy“. Reinhardt et al. (2009) also state “Lampreys often attached themselves to the ramp, but without a gain of vertical height between repeated attempts” and that “Only ramps of shorter than half the body length of the lamprey could be surmounted”. They note that “The lampreys had to have their dorso-ventral fins fully submerged in the downstream pool to create enough propulsion to scale a ramp”. They found that “Independent of ramp angle, no fish passed over a 30cm ramp”. Reinhardt et al. (2009) also state also state that “an analyses of 1,300 passage attempts in a field-validation experiment showed a greater apparent motivation to move up a ramp, but reconfirmed our laboratory findings on passage technique and maximum performance”. Mulkear Life also stated that lampreys were attracted to their ramp, and their videos are actually consistent with the Reinhardt et al. (2009) conclusion. Although the Reinhardt et al. (2009) concerned North American landlocked sea lampreys, which are smaller than European anadromous sea lampreys, it is noteworthy that no actual scientific data has been presented to show that lampreys can climb the Mulkear Life pass. It is noted that the protrusions placed on the Mulkear Life lamprey ramp do little to slow flow velocities across the ramp over the vast majority of flows. We are essentially dealing with a ramp like the Reinhardt study here. The important issue is that there is no science behind this. No scientific method has been followed to demonstrate that this lamprey pass works. It is the opinion of Lamprey Conservation and Management, that the experimental Mulkear Life pass offers (1) little or no help to sea lampreys in the River Mulkear, (2) no help to river and brook and lampreys, and that anadromous lampreys are still generally confined to below Annacotty Weir on the Mulkear River. More worrying, we are of the opinion that the Mulkear Life experimental ‘lamprey pass’ on the Mulkear may be counter-productive as it may expose the lampreys to increased predation. Over the majority of flow conditions it is clear that this ramp would offer little or no assistance, and no scientific evidence has been presented to date to suggest that this would be a suitable solution for this site. We are also very concerned that this pass is being presented as a success story, and that this general design is being recommended for other sites. 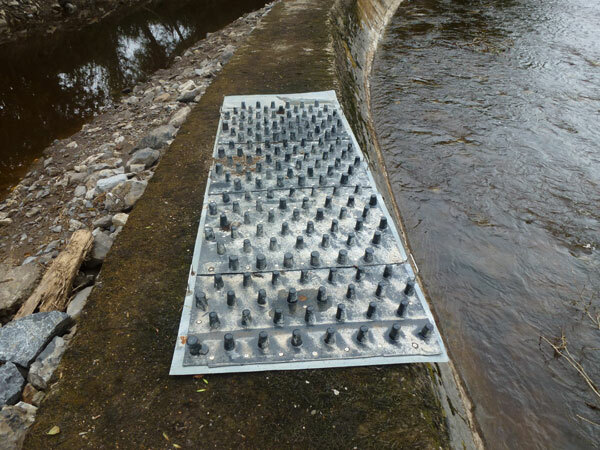 In 2012 Mulkear Life installed another of these ramps at Ballyclough Weir, which the third obstacle to lamprey migration as you move upstream on the Mulkear (the second being Inland Fisheries Ireland’s crump weir). In July 2013 Mulkear Life decided to remove this weir (during the sea lamprey spawning season) and our staff found the ramp dumped at the site during August 2013. Perhaps, Mulkear Life also have come to the conclusion that these ramps do not work. Lamprey ramp from Ballyclough weir discarded at the site during August 2013. 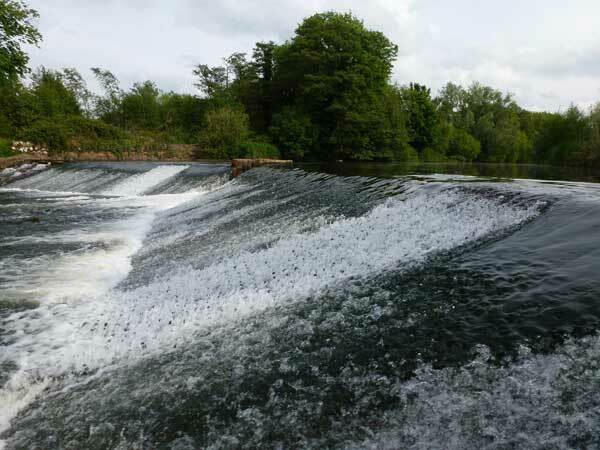 For more on the story of Ballyclough weir please click here. PS : See here for updated comments.